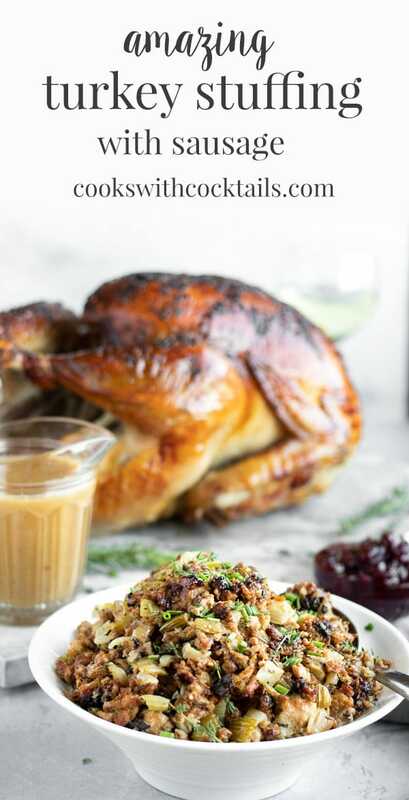 This turkey stuffing recipe is so amazing that you will never need or want another recipe for your turkey dinner. Its packed with sausage, spices, veggies and a little bread. It really is the best turkey stuffing and its the only one that Debbie and I ever make and for good reason. This post will help you make it perfectly. We make this turkey stuffing recipe for every turkey dinner on Easter, Thanksgiving, and Christmas. We love it because it’s got a bit of bread, but not a ton of it so its mostly veggies and sausage but still got that bread stuffing texture. 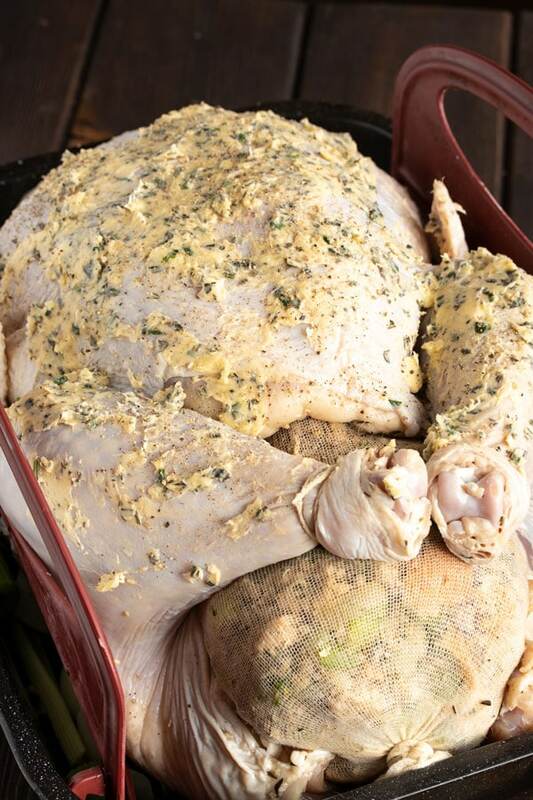 Its also got a TON of herbs in it which gives our stuffing a delicious savory flavor. 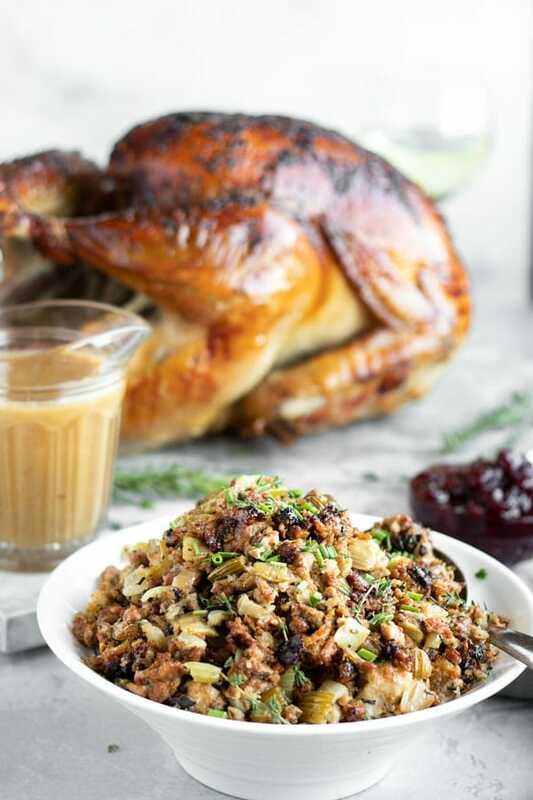 Pretty much every time we make this turkey stuffing, we make it along side our brined turkey. This post for how to make a brined turkey will help you make the juiciest roast turkey with a step-by-step, 3 day plan for making a complete turkey dinner without getting overwhelmed! Now lets get on with the stuffing recipe! 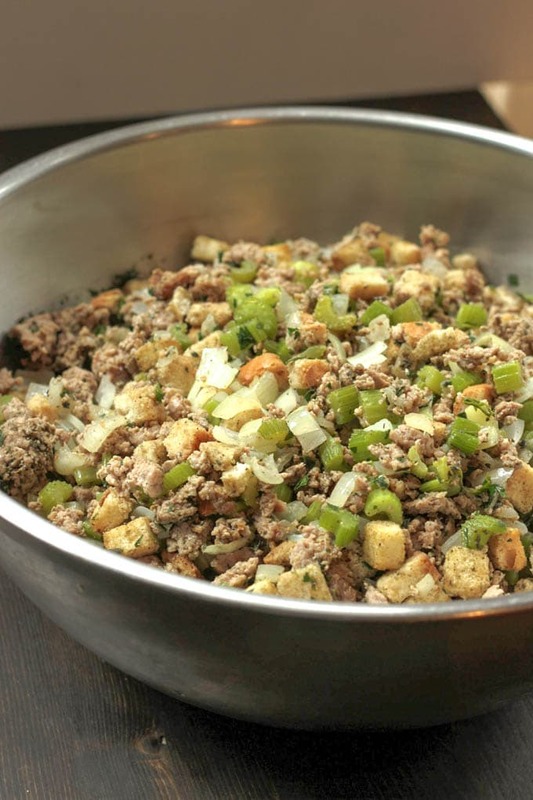 Here are the ingredients you will need to make this turkey stuffing recipe. The ingredients are simple, but when combined together and stuffed in the turkey, they are amazing! Cut up your bread, lay it on a baking tray and bake it at 200 degrees for about 45 mins or until it just starts to dry out. Heat a large frying pan to medium heat. Add the oil, chopped celery, and onions and saute until tender. Once they are tender put them into a large bowl. Next cook the sausage in the same pan. If it has lots of fat, make sure to drain it or remove most of it with a turkey baster. When fully cooked, add the sausage to the large bowl as well. Chop the fresh herbs then add to the bowl. Add the slightly dried bread cubes and mix it all together. Cover it and put it in the fridge until you are ready to cook your turkey. You can buy your sausage pre-ground and not in casings but make sure you don’t get a spicy sausage. There is a ton of veggies in this recipe. Don’t be scared…. Make the whole thing. 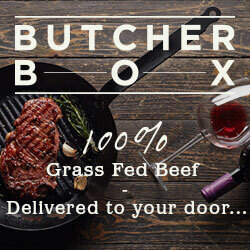 Trust me, people will love it and eat it! It also tastes amazing in turkey sandwiches and for leftover turkey dinner. Make sure not to add any salt to the stuffing if you are brining your turkey. The turkey will release some of the salty brine water and flavor the stuffing with it. When you are ready to cook your turkey, make sure your turkey is prepped. Washed, brined (if you are brining it) and flavored according to the recipe you are following. Check out our recipe for brined turkey here. Fill a cheesecloth bag with the stuffing and place it inside the turkey before you cook your turkey and cook it with your turkey. Any remaining stuffing can be cooked by itself in a crock pot on low for about 4 hours as your turkey cooks. If you do this, add about 1.5 cups of chicken stock to the crockpot while the stuffing cooks in there. You can also add the extra stuffing and chicken broth to a casserole dish, cover it, and cook it covered in the oven with the turkey. It will only need about 45 mins to cook so just put it in at the end of the turkey cooking time. 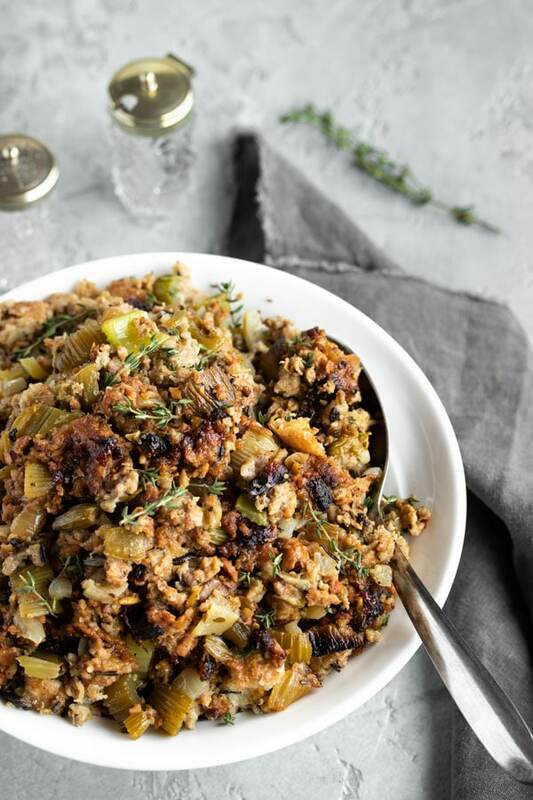 If you’ve tried this turkey stuffing recipe then don’t forget to rate the recipe and let us know how it turned out in the comments below. We love hearing from you! 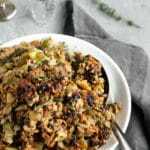 This turkey stuffing recipe is so amazing that you will never need or want another recipe for your turkey dinner. Its packed with sausage, spices, veggies and a little bread. It's the only one that Debbie and I ever make and for good reason. This post will help you make it perfectly. Chop the fresh herbs and add them to the bowl. Add the slightly dried bread cubes and mix it all together. Cover it and put it in the fridge until you are ready to cook your turkey. When you are ready to cook your turkey, make sure your turkey is prepped. Washed, brined (if you are brining it) and flavored according to the recipe you are following.